For a decade or more my husband John and I have been intending to coincide a trip to the Eternal City with Scotland playing Italy there in the Six-Nations. Well some days back the two things finally came together after Sergio, a fellow rugby-loving Roman citizen and great friend of ours, invited us not only to dinner but the match too! Anticipation kicked in the day before at Heathrow when, after being transferred from the car park to Terminal 5 in one of those wonderful little robotic-voiced, driverless electric Pods – definitely my favourite form of transport, ever! – we and our fellow-travelling friends from Glasgow, Neil and Jayne, were confronted at the departure lounge with a sea of tartan, in which kilts appeared to outnumber trousers 4-1! An amicably boisterous flight out was unfortunately followed – in complete contrast to the effortlessly sedate Pod transfer back at Heathrow – by the taxi journey from hell. The drive in on the motorway from Leonardo da Vinci airport was one thing: pre-booked black-windowed mini-van… dark-suited driver in shades, even though the sun had long gone down… having a heated conversation with someone (sounded like an irate woman’s voice) on the other end of his hand-held mobile while steering with the other hand… alternately speeding and braking violently, in and out of three lanes of heavy rush hour traffic… the ‘highlight’ being, in the face of three lanes stalled by an accident up ahead, a complete U-turn across the slightly raised central reservation and heading, briefly, back in the direction from whence we came. 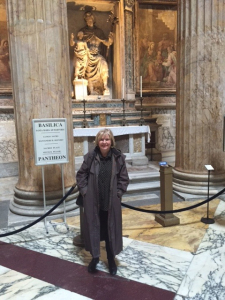 Another thing altogether, however, was when we reached the centre of Rome! If you haven’t had a chance to see the new Bond film, ‘Spectre’, yet I strongly recommend it, if only to get a better sense of what the finale to our cab drive was like. In the film there’s a spectacular car chase between 007 in an Aston Martin and a particularly menacing villain in a Jaguar. At one point they swerve at breath-taking speeds over the bumpy cobbled road that curves around the Vittoriano, the huge turn-of-the-20th-century monument to Victor Emmaneul II sited at the other end of the Forum to the Colliseum. Well, we followed exactly the same route around it, the only difference being we were travelling in our bone-shaking minicab at least twice as fast as the Aston and the Jag! Safe arrival at our hotel a few minutes later probably counts as a minor miracle! Located in the Piazza della Maddalena, the Relais Maddalena was a wonderful surprise. In fact, it took a puzzled minute or two to locate it: the entry, most un-hotel like, being a small, non-descript painted door within a pair of slightly larger painted doors. Inside, a long flight of huge stone steps (there was no lift) took us up from a cavernous hall to the rooms above. They were lovely: 18th possibly early 19th century, hardwood-floored, high-ceilinged with wooden beams interspersed with hand-painted decoration, furnished with a successful fusion of antique and contemporary furniture, and en-suite with ultra-modern shower rooms. Even better, however, was the view from our bedroom window, which overlooked the piazza and the little church of Maria Maddalena opposite, built in the Baroque style in the 17th century, but with an exquisite 18th-century Rococo façade. The interior, elaborately painted, stuccoed, gilded, and lined with elaborate and rare polychrome marble was also, as we discovered on our first exploration of the piazza, wonderful and well worth a visit. However, before retiring our first evening in Rome concluded on a culinary note, the stand-out moments being the delicious rosemary-infused focaccia in the excellent little restaurant attached to the hotel and, just around the corner, four-scoop cones (you could order up to 8 scoops!) from the fabulous Della Palma ice-cream parlour in the via della Maddalena. As my husband John pointed out after polishing his off, with 152 different flavours on offer we’d definitely be popping back in after breakfast. Day two – Match Day – began, after the aforementioned breakfast and ice-cream, with a visit to probably my favourite building in Rome: the Pantheon. Only 200 yards away from our hotel, in the Piazza della Rotonda, it was built by the emperor Hadrian c.126AD on the site of an earlier building commissioned by Marcus Agrippa during the reign of Augustus (27BC-14AD). Comprising a huge rotunda under a breath-taking coffered concrete dome with a central opening (an oculus) to the sky, it is fronted with an equally impressive portico of huge granite Corinthian columns. One of Rome’s best-preserved buildings, it has been used as a church since the 7th century, and also as a tomb – the great Renaissance painter Raphael being it’s most eminent occupant. Following a leisurely al-fresco coffee and pastry in a restaurant opposite Bernini’s spectacular 1651 ‘Fontana dei Quattro Fiumi’ (Fountain of the Four Rives) in the nearby Piazza Navona, we set off for the game at the Stadio Olimpico. After an obligatory ice-cream (this time an organic, or ‘biologique’ one) nearby with our Italian friend Sergio, his wife Franca, and son Jacamo, we took our seats and although the stadium was awash with Tartan we were most definitely in an Italian section. I am very happy to report, however, that when the national anthems were played before kick-off what my husband described as my hugely over-enthusiastic and incredibly loud personal rendition of ‘Flower of Scotland’ was met with benign amusement by the surrounding Italians; if it had been a soccer match I have a feeling it might well have elicited a rather different response! As to the small matter of the game, the crux of the matter is WE WON – 36-20! Having thundered into a 17-3 lead with clinical early tries from John Barclay and John Hardie, it all got a bit nerve-racking after Italy responded with scores from Ghiraldini and Marco Fuser, and we then lost Finn Russell and WP Nel to the sin-bin in the last quarter. However, Greig Laidlaw’s nerveless goal-kicking and Tommy Seymour’s late try saw us over the winning line at last! I left the stadium emotionally drained, hoarse, and a very very happy bunny! As on day one, match day ended on a culinary note, and a very special one too. Sergio and his family took us for dinner at Osteria La Gensola, a Sicilian seafood restaurant in the Piazza della Gensola, Trastevere, just the other side of the Tiber. Great atmosphere, fabulous food: if you go to Rome, do go, although its popularity with the locals means you will almost certainly need to book in advance. In contrast, in soon-to-be-posted Part 2 of our Roman expedition, I’ll be recommending an equally good, locally popular restaurant, which, surprisingly, given its proximity to the tourist hubbub of the Spanish Steps, you won’t need to book in advance – well, at least at lunchtime!